Unlike many other repellents that work as taste deterrents, requiring the deer and rabbits to browse to be effective, Liquid Fence works on scent, so the animals don't even have to take a bite to be repelled. 32 fl. Oz. Apply liberally to plants and their perimeter during a dry period. Repeat process 1 week later and then approximately once per month thereafter. 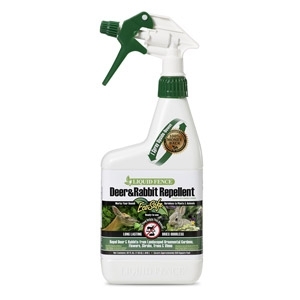 Areas where feeding pressure from deer and rabbits is intense, spray Liquid Fence Deer & Rabbit Repellent once a week for 3 weeks and then approximately once per month thereafter.